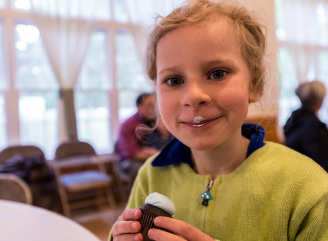 We have lots of kids at St James, and they are an integral part of our congregation. The smallest ones are heard during our hymns (and often at other times! ); older ones serve as acolytes and readers. The greatest gift you can give your children is the gift of faith. At St James, we want our children to grow up knowing Jesus and secure in their relationship with God. In addition, we're aware that research has shown that children with a religious background are better able to make wise life choices. We welcome children to our services. You are welcome to sit anywhere you wish, although many children find it easier to focus when they are close to the front and can see. At the back of the church we have removed some pews to make space for small children who need to move around. And many families choose to sit upstairs in the balcony. We encourage kids to participate as much as they are able. Children's Communion Books are available from ushers, as are activity bulletins for ages 3-12. Kids are welcome to play with quiet toys and east simple snacks during the service (but please clean up after them! ); you may wish to remove their shoes if they are at the stomping stage! "Dear Parents With Young Children in Church" is a great article which expresses our attitude to families in church. In the waters of baptism we are lovingly adopted by God into God’s family, which we call the Church, and given God’s own life to share and reminded that nothing can separate us from God’s love in Christ. In the Episcopal tradition, a person may be baptized at any age. Parents who bring their young children to be baptized make an additional commitment to raise these children in the Christian faith. The first step to planning your or your child's baptism is to come to church on a Sunday and meet the Rector. She will then arrange to meet with you for preparation. More information can be found here. St James follows the Episcopal Church's position on the reception of communion, which states that all baptized Christians are welcome to receive the Eucharist. Children have an amazing understanding of what they are doing, and frequently surprise us with the depth of their reflections on the sacrament. Typically, children receive for the first time on the day of their baptism (babies not yet eating solid food receive wine only). We offer "Jesus bread" to all children who express a desire for it (by reaching out or asking); they may also receive the cup by sipping or dipping their bread. Often when our children are in early elementary school and their Roman Catholic friends are "making their first communion", they want to do some more formal education. The Rector is happy to visit families in their home and, in the context of a meal, provide education about the Eucharist.